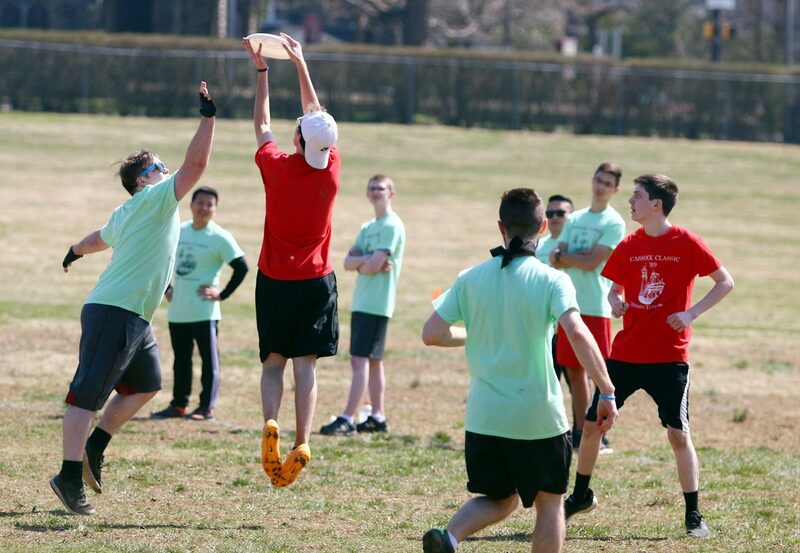 Faith, fellowship and flying discs abounded as St. Charles Borromeo Seminary held its sixth annual Cassock Classic Tournament on Saturday, April 6. It was an opportunity for Catholic young adults to have some fun playing Frisbee and build friendships under the day’s warm sunshine. The coed “Ultimate” tournament also provided young men a unique opportunity to get a glimpse of seminary life. Approximately 130 young adults participated in this year’s Cassock Classic, representing several young adult ministries in the area as well as Newman centers from Temple and West Chester universities. Joining them in the competition were approximately 40 seminarians from St. Charles, some of whom formed their own team while others joined the rosters of the various young adult groups. Eight teams total took part in the tournament, which is open to competitive and non-competitive players alike. 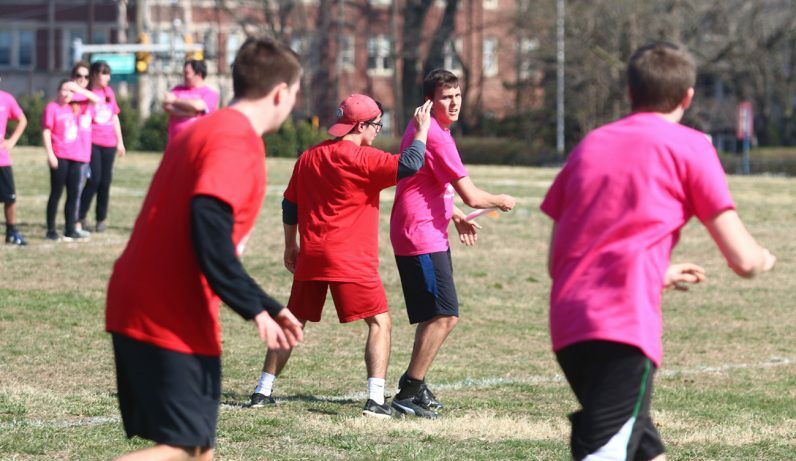 “Ultimate” is a non-contact sport played with a Frisbee in a style similar to football. Alison Joyce, of the Catholic Young Adults of Chester County, plays Ultimate competitively for the Philadelphia Area Disc Alliance, and has participated in three Cassock Classic tournaments. Duncan McLuckie, a member of Metanoia, a young adult group from Montgomery County, was a newcomer to the Cassock Classic. Father DeLacy originally conceived the idea of holding an Ultimate tournament for the purpose of fellowship while serving as chaplain for Metanoia, with the Montgomery County group hosting the event. Bishop Timothy Senior, rector of the seminary, celebrated Mass for the attendees before the tournament began on Saturday. During lunch break in the refectory, seminarian Henry Graebe spoke to attendees, sharing with them his vocation story. The Catholic Center for Young Adults won the championship game, defeating the Cathedral Young Adults. Evening Prayer closed out the day.